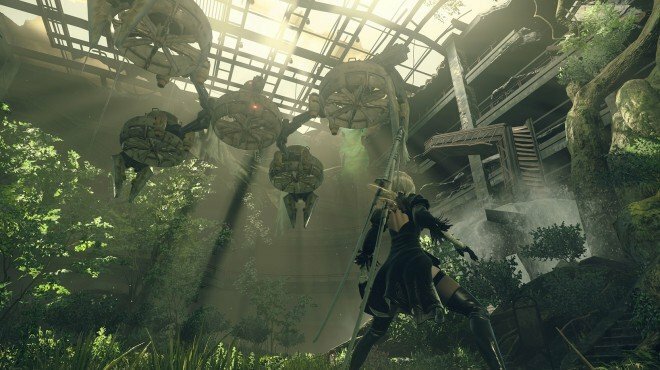 Flooded City Recon is a Main Story Quest in NieR: Automata. "The central portion of City Ruins has caved in, revealing a flooded cave within and showing an Alien signal for the first ime in hundreds of years." Roam around the tunnels, discovering a chest with 3x Titanium Alloy in the way. You will come to a set of stairs going up into a bright blue room. This will trigger a boss fight.with Adam & Eve. They reveal that they destroyed their creators, the Aliens, and that machines have evolved and think they may destroy androids as well. They reveal they want to dissect the humans on the moon to analyze them. 9S and 2B refuse to cooperate with them. Adam & Eve escape, triggering the trophy Creation and Insurrection.